Purpose: Use this document as a reference for calculating and viewing concurrent tuition for a student in ctcLink. There are three required steps to calculate concurrent tuition for students enrolled at more than one institution. 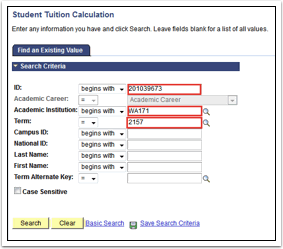 Enter the Student ID, Academic Institution, and Term then click Search. Select the Concurrent Enrollment tab. 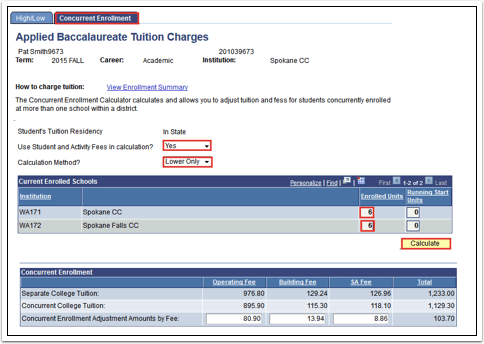 Select Yes or No to include Student and Activity Fees in calculation. Enter the Enrolled Units from both colleges. To view the student’s enrolled units, click the View Enrollment Summary link. Enter the Running Start Units from both colleges if the student is a Running Start student. Otherwise you may leave these fields blank. If a student has registration of both Concurrent and Hi/Low tuition, the Concurrent must be calculated first, then the Hi/Low. DO NOT POST or LEAVE THE PAGE, prior to completing both calculation methods if the student has both, or the adjustment must be done manually. If the message “'Upper/Lower Adjustment Amounts by Fee require manual distribution,” is displayed, enter the appropriate amounts manually, and then enter the Concurrent Enrollment Adjustment Amounts by Fee. Validate that the Concurrent Enrollment Adjustment Amounts by Fee are correct. If the adjustment values are incorrect, change the values before you click the Post button. Select the college to post the waivers with the drop down menu on the bottom left of the page. .Validate that no other adjustments can be made for this student in this term. Use the arrow to scroll to the correct Academic Career (if needed). Use the lower arrow to scroll to the correct Academic Institution and Term. Click the Calculate Tuition and Fees button. Scroll to the correct Academic Career, Academic Institution and Term to review fees. Click the Calculate button to calculate concurrent tuition, posted waivers, calculated tuition and validated posted waivers. Click the Display Student's Account link (top left). Click the Account Details link for the appropriate account and term. Validate that the two or three waivers exist with the correct amounts (amounts are under the green columns -Operating Fee Waiver Amount, Building Fee Waiver Amount, SA Fee Waiver Amount). Select Add a New Value. Enter the Business Unit, ID, Term, and Waiver Code. Enter the Effective Date and select status of Active. 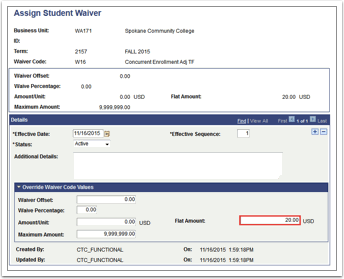 Optional: In the Flat Amount field in the Override Waiver Code Values, you can change the amount to reflect a different dollar amount to be waived from the student’s account, based on your calculations. 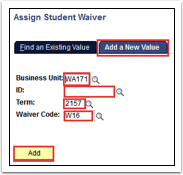 In the Flat Amount field in the Override Waiver Code Values, you can change the amount to reflect a different dollar amount to be waived from the student’s account, based on your calculations.